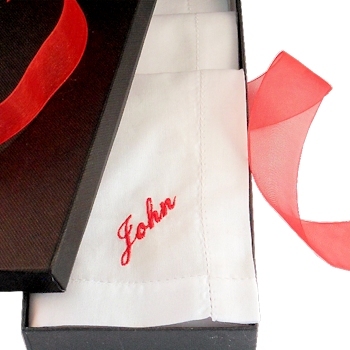 Mens personalised hemstitched handkerchiefs in traditional black gift box. Mens personalised hemstitched handkerchiefs in traditional black gift box. Gift set of 3 handkerchiefs that you can choose to have personalised or monogrammed with initials or an embroidered name in a font style of your choice and sewn your favourite thread colour. These white cotton hankies measure 40cm x 40cm (16 inch) and feature a 1/4 inch wide punch hemmed edge. This is a superb personalised gift set consisting of 3 large mens hemstitched handkerchiefs which are supplied in a traditional black gift box with lid and a coordinating ribbon tied around. Please allow approx 48 hours for personalised orders to be dispatched as they are made to order by Amys Gifts. Size: 40cm hankies with 1/4 inch wide hems.